Halloween is here! It is to a certain extent believed that many of the rituals and traditions in connection with Halloween go back to old Celtic harvest festivals. These rituals are believed to have pagan roots and to then have been Christianized and connected to the All Saints’ Eve. Anyway, today it is Halloween and the harvest of 2018 is over. Days and weeks of hard work picking grapes in the vineyards, making several selections, destemming and crushing to send the must to fermentation is done. At wineries all over Italy they can start to breathe again, so to say. Of course, the work in the wine cellar continues but the main worries about the weather conditions and the right moment to pick the grapes is over for this year. 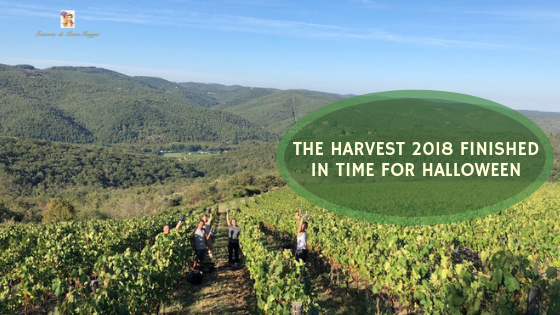 In early August, Coldiretti (an organization of agricultural entrepreneurs on an Italian and European level) predicted that the production would increase by 10-20% during the harvest this year. They thought the total production would be around 46-47 million hectoliters instead of 40 million hectoliters as during 2017. The predictions turned out to be correct as according to Coldiretti and Ansa, the total production increased with 16% in relation to last thus reaching almost 50 million hectoliters. The quality is considered to be high also this year with about 70% of the total production destined for DOCG, DOC, and IGT wines in Italy. Another important data is that the export keeps moving forward steadily and has increased by 4% during the first half of 2018. Not only the export but also the domestic consumption is on the rise with an increase of 4.5% this year (See Primo bilancio positivo per la vendemmia 2018). As you see the numbers are considered to be much more positive for 2018. When we speak about 2018, we have to remember and take the incredible heat wave in 2017 into consideration. A heat wave of this severity has had repercussions by reducing the yield also in 2018 and perhaps also in 2019. This remains to be seen though. Ilaria continues to explain that the spring was a bit late and very rainy this year and that there furthermore were three consecutive days of hail. However, it was not disastrous for Montemaggio as they did a selection very early thus concentrating the yield immediately. In June, it started to be warmer as usual and all the summer months looked quite promising with the right amount of sun and large differences in temperature between night and day. This is a very good thing. (Usually, it is so warm in the summer months that we sleep with little to no clothes while we this year often slept with a sheet or light cover) It looked to be a very nice vintage. The Chardonnay grapes were first out to be picked in early September. They had an amazing balance, even though perhaps a bit high alcohol level. At the beginning of September, after the Chardonnay harvest, it was very rainy again. However, the sun peeked out again so that the Ciliegiolo, Malvasia Nera, and Merlot grapes could do the last part of their ripening. The Merlo was harvested only at the end of September. Some of the Sangiovese vines suffered a bit from the rain which resulted in us needing to harvest the part of the Sangiovese grapes used for our Rosé di Montemaggio a bit earlier than usual. Furthermore, we had to do a selection and throw away a part of them. October arrived with great sunny and dry weather again. This was very good for the last maturation period of the Sangiovese grapes. Pugnitello were the last grapes to be harvested. Usually, we harvest the Pugnitello just a few days after the Sangiovese but this year the rain that usually falls in mid-October never happened. In that way, we could let the Pugnitello grapes mature nicely for another while. If we now go over to discussing the quantity, it has, in general, been very low. First and foremost due to the repercussions from last year’s heat wave but also due to the rain at the beginning of September. As mentioned above, the rain damaged a part of the Sangiovese and we had to do a rigorous selection. An important factor to keep in mind though is that whatever the year and the climate conditions look like the quality never suffers at Fattoria di Montemaggio. We always do whatever we can and take all necessary steps to pick only the tasty, ripe, and healthy grape bunches!